David Papp can take the perceived complexities of technology and richly break them down for audiences to easily grasp and own new skills. His presentations offer audience relevant and strategical practical solutions. He delivers powerful presentations in an interesting and entertaining way which allow the audience to connect to his advice and take advantage of his knowledge. His expertise is beyond reproach and his presentations are passionate, humourous and engaging. David Papp always delivers presentations with the input of the conference/event organizer. Every client has different need and objectives and he tailors his presentations to exceed audience expectations. He is a tech pioneer specializing in Social Media, Cybersecurity & Privacy, Technology Management and Blockchain. Above all, the impact of technology impacts the result in business growth and success. David Papp has a degree in computer engineering and numerous industry certifications over 25 years,. 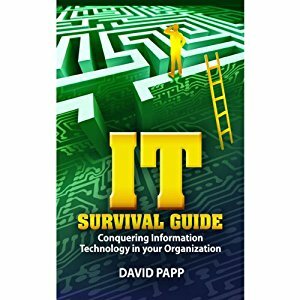 Because of his unique approach to technology, David Papp helps organizations and individuals embrace technology to thrive in our online world. As a result of his business success, he is a very popular media resource as an everyday “tech expert” and loves speaking on any technology topic. We often hear that Information Technology (IT) is a boring subject. Furthermore, general perception of the IT world is that is is too complicating for us to understand. We usually pass on the responsibility of our tech business solutions for the specialists and tech junkies. In contrast, it is one of the most relevant subjects in a global community that relies on the networking and infrastructure that bind us together. If there is a lackluster perception of the IT industry, it largely is a consequence of the complex technical terminologies and explanations offered by people in the industry. David Papp is a well-known expert in the field of Information Technology who has learned and practiced his trade in Canada throughout his career. Papp’s dynamic personality, experience and knowledge gained from over twenty years in the technology industry has made him a highly-sought expert for tech trends and cyber security presentations. In addition to numerous industry certifications (Cisco, Microsoft, VMware, security, auditing, and others), David Papp has a professional computer engineering degree. He is an active member of the Canadian Association of Professional Speakers. The use of online technology to intimidate, threaten and abuse people has received an increasing amount of media attention in recent years. Perpetrators often operate behind anonymous identities & digital barriers and this can cause irreversible damage to everyone involved. To safeguard and minimize the potential risks from CyberBullying, there is a growing need to increase awareness and education for how to safely participate online. Marketing strategies have dramatically shifted with the rise of Social Media platforms. The opportunity to reach an “always-connected” marketplace is huge. This presentation asks seven important questions you should consider before you decide what social networks to engage with, and provide you with the reasons why. Learn about the power of automation, analytics and creative strategies, all of which will bring you more success online and a greater marketing ROI. Staying secure in a hyper-connected world is a growing concern. To minimize risk and protect yourself, it’s important to become educated about the issues and the best practices for prevention. David will show you the many forms of invasion (hacking, phreaking, malware, spyware, ransomware, viruses, spam, etc) and what to do if you encounter any of these unfortunate abuses of technology. For all its wonderful benefits, technology has left us more vulnerable to cyberattacks, fraud, privacy concerns and identity theft than ever before. How do we identify these threats and protect ourselves from the risks of being online? David, an online security expert, will help you gain awareness and to learn key prevention tips. Education is the best defense for protecting yourself! Does your online presence make your business attractive to prospective employees? The simple days when job seekers thumbed through the pages of the local newspaper for an opening have passed. Learning how to engage with an ideal employee requires a greater understanding of demographics, online social behaviours and effective online tools. It pays to know where your target employee is most likely to frequent online, how to utilize those marketing opportunities, and how to get the most effective message to them. This presentation will help employers reflect and pivot on these important considerations. Social networking has become an integral part of the global fabric that stitches us together. Consider that today’s generation has never experienced life without the Internet, cell phones, and personal computers. It’s not going away. From Facebook, Twitter, and Instagram to Pinterest, Google+ and YouTube – each of these social platforms is powerful in their own unique way. Grasp the growth and impact of Social Media, recognize the potential and decide how you can benefit moving forward! A great website remains the centerpiece of a strong, modern marketing strategy. Fortunately, there are numerous online resources available to allow you to create a highly functional, dynamic and mobile friendly website without breaking the bank. This presentation introduces you to an essential checklist for getting your website project started. You’ll learn about some useful and low-cost (and many free) online tools that you should know about. Get valuable insight about optimizing your website for a better ranking in search engines. In the end, you should be proud of your website, and this will get you moving in the right direction! Is your IT system an asset or a hindrance to your organization's success? More important, can you tell the difference? Unlike other well-recognized professions, information technology is still in its infancy. Organizations have little hesitation in paying attorneys, accountants, or business strategists for their expertise. As individuals, we don't blink an eye while paying for a physician's opinion of our health. Yet business executives rarely think to request a professional opinion from an IT consultant. If organizations wish to succeed in the future, however, this practice needs to change. Business owners and executives often see IT departments as financial drains and necessary evils rather than as additions of value to their organizations. And IT professionals typically are unable to effectively communicate the benefits of IT investments to the organization due to limited "soft" skills. But both have responsibilities to establish more-effective communication and understanding, so that overall goals can be aligned. With this book you will gain an understanding of how IT systems and tools can offer your organization the best chance to succeed. Additionally, you will appreciate the value of IT assessments and professional consultations. In today's global market, information is indeed the most valuable commodity. Knowing how to best manage your organization's information with effective and efficient IT systems is therefore essential. This book aims to equip you with this valuable knowledge and enable you to achieve the success you desire. The book is published by PFH Publishing.